When a middle-aged man is found dead in a hotel room, it seems like a routine matter—until it becomes clear to DI Wesley Peterson that it is a case of cold blooded murder and that the identity the victim has been using isn't his own. Then DCI Gerry Heffeman, frustrated at being given only cold cases during his recovery from being shot in the line of duty, discovers from a DNA review that Wesley's mystery man was responsible for the murder of a child back in 1979. But soon, as Wesley delves in to the events of the past more people die. Meanwhile archeologist Neil Watson is investigating a ruined village that tumbled into the sea during a storm at the time of World War I. Events take a cryptic turn when he encounters a 100-year-old mystery with echoes in the present. As a terrifying truth is revealed, Wesley has to face a great danger, especially if he is to save someone very precious to him. 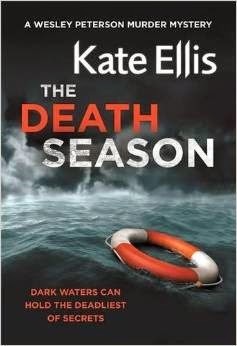 Review: This is my first book by Kate Ellis and you might think that starting a series on the 19th book is not the best idea, but The Death Season can perfectly be read as a stand alone. I never felt like I was missing any crucial information, quite the opposite, I could see there was a lot back story to the characters but this only made me want to pick the previous books, because I really enjoyed meeting them for the first time and I wanted to know more about them. The Death Season handles three different stories. There are extracts from a diary that a girl wrote during WW1 at the beginning of each chapter. Then in present day, there was the murder in the hotel that seemed to be linked to a cold case from the seventies and then, there were the excavations in a ruined village engulfed by the sea during WW1. As you can tell, there is a lot going on but in no moment did I feel like it was too much, the transitions from one story to the other were clear and soon you could see how all of them were linked one way or another. I really enjoyed reading about Wesley Peterson, he was a very clever and intuitive investigator and you could tell how he was struggling with the demands of this job. He couldn't see his family as much as he wanted. Plus, there was Rachel, his colleague who had feelings for him. It was obvious that he was not comfortable with this situation and this made their interactions really interesting to read. I also liked Gerry, their chief, a lot. He was recovering from a shot but didn't want to miss anything, investigation or gossip, he wanted to know everything. The Death Season is very enjoyable read, I never got bored and I was quite hooked trying to guess who the murder was. It surprised me more than once with its clever twists and unexpected links between stories and I am sure I will be checking more Wesley Peterson books.